If you want donors to come back, pay attention to them. In fact, shower them with love. One of the best ways to do that is to thank them as many times and in as many ways as you can dream up. Fortunately, with all the channels of communication we have, there is no limit to how you can thank donors quickly and inexpensively. No longer do we just think about a great mailed thank you letter, although that is super important. Charities who thank donors well, do it in multiple ways, in various formats, and as quickly as possible. One fantastic and direct way to say thanks is with a dynamite post-donation landing page. As soon as the donor finalizes his gift, whisk her off to a page that says thanks. However, don’t waste that real estate! Accomplish at least one more goal with it. Here is how post-donation pages can do more than one job. Invite donors to follow you on social media. First, keep it simple. Don’t send donors off to a myriad of social media networks. Pick your best ones and include big, bright, clickable buttons to take donors there. Invite donors to watch a video You can insert a video right on the thank you page. Donors are likely to look at it at that moment, and the video will reassure them that they have made the right decision. Invite donors to volunteer. There’s no better way to retain donors than to get them to volunteer. Volunteers are your best donors, hands down. On the thank you page,tell them you’d love to have their help and then link to your volunteer page on your website. Connect your donor with resources. Describe and link to your online gift shop, your animal adoption center, your evergreen articles on important issues. Gather feedback. Explain to your donor that you always want to improve your service and ask her to help by leaving feedback about the donation process itself. Was it easy? Confusing? How could it be improved? Provide testimonials from the people you serve. There’s no better way to reassure the donor that his decision to give was a good one than by listing a couple of testimonials from the people or animals (you can give them voices!) you help. Include photos, and you have a winning combo. Invite donors to something special. Got an event coming up? Let your donor know with a tantalizing teaser that links out to more information. The event could be a peer-to-peer fundraising campaign, a fun walk or run, or a tour of your workshop, ranch, shelter, or museum. Remind your donor of an additional way to give You might want to guide your donor to your planned giving page, a monthly giving page, or, as charity: water does in the example above, to your signature giving campaign. For charity: water, their signature event is its hugely popular birthday campaign. On the charity: water post donation page, you can fill in your birthday and get reminded when it approaches about how to ask your friends for a donation instead of a gift. Charity: water adds even another layer to keep donors engaged longer. Filling in your birthday leads to another thank you and a video about birthday campaigns. 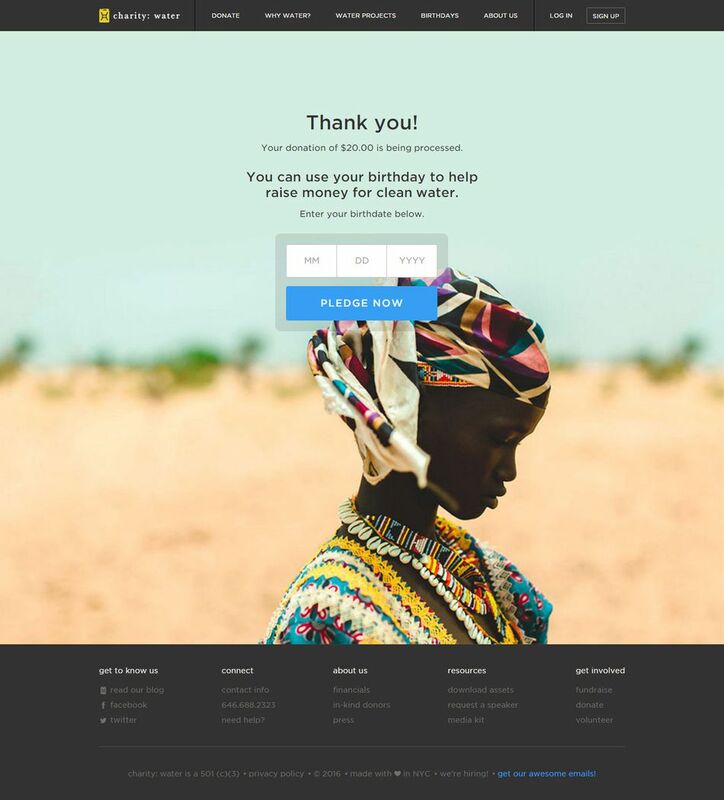 Your post-donation page can be simple or multilayered. However, do design one. Don’t just leave your donor hanging in a void. Thank her quickly, and then keep doing it with follow up emails or a mailed thank you note. Check out the post-donation pages below to spur your imagination. This simple post-donation page from Martha's Table shows how easy it can be to thank donors right after they donate. This one is simple but heartfelt. It also includes (not shown in screenshot) a summary of the donation. Notice too that the message mentions when the donor can expect a thank you letter in the mail. I love this post-donation page from Save the Chimps! Save the Chimps rescues chimps from dire situations such as research labs and gives them room to roam with plenty of good food and loving care. In all of its communications, Save the Chimps features beautiful portraits of these wonderful animals. When you donate to this organization, you become a member of the chimp family and get to know them very well.